Garlic Buffalo Air Fryer Chicken Wings have become a new favorite around my house. I don’t want to keep a favorite recipe from you, so here is one of my new favorite air fryer recipes, and it’s perfect for low carb and keto diets. 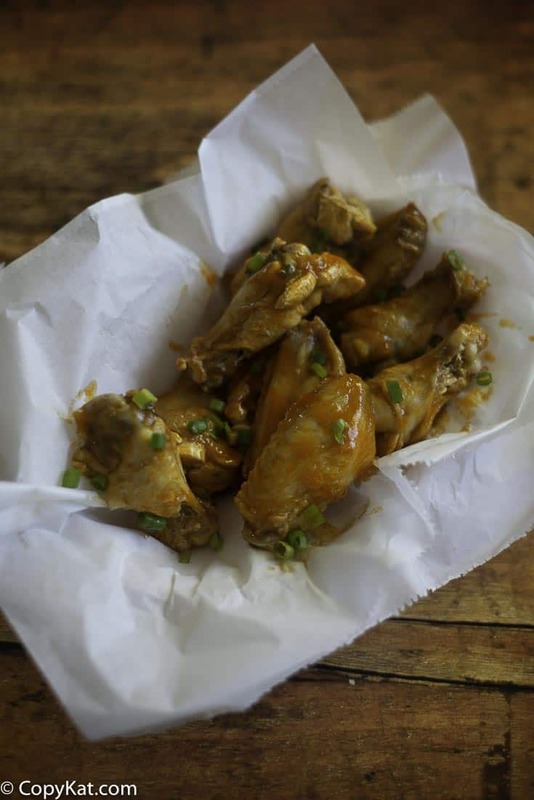 These are your basic chicken wings made with a garlicky hot sauce in an air fryer. These crispy wings will leave you licking your fingers and wishing for more. Airfried chicken wings are so crispy and tasty without using any extra oil. Making them in an air fryer is healthy and cleaning up is easy. Fry without the fat – the wings taste just as good as deep-fried. An air fryer is really just a small convection oven that enables food to crisp up and cook rapidly. It sits on your kitchen counter and works by speedily circulating hot air around food to cook it quickly. An air fryer comes complete with a removable basket similar to that of a deep fryer. Instead of plunging the food into hot oil as in a deep fryer, the food in an air fryer basket is baked by the heat from the air flowing around it. An air fryer really shines at mock deep frying. How Many Wings Can You Cook at Once? The number of wings that you can cook all at the same time depends on the size of your air fryer. I have a Panasonic and I can fit about 10-12 smallish wings in it. Click here and here to see reviews of different makes and sizes of air fryers. There are lots of air fryers on the market so you are sure to find one that’s just right for you. You can to a limited extent. Keep in mind that successful cooking in an air fryer depends on air circulating through. So you can stack a few wings on top of each other, but don’t pack them in there or they won’t crisp evenly. It might be better to cook them in two batches. 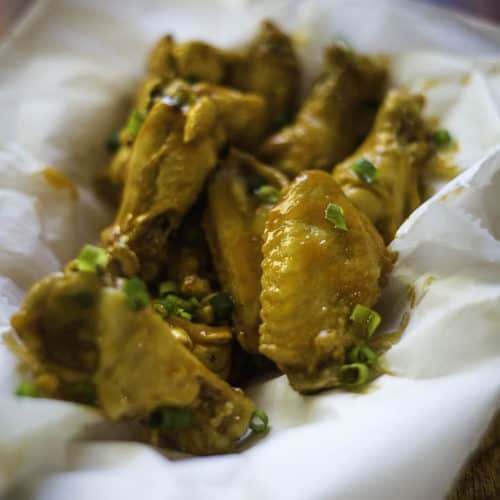 Can You Cook These Wings Without an Air Fryer? Yes, if you don’t have an air fryer, you can cook these wings in the oven. Place them on a baking rack on a cookie sheet and bake at 400 degrees for about 25 minutes. Love Hot Wings? Just click here for no less than 39 must try chicken hot wing recipes. 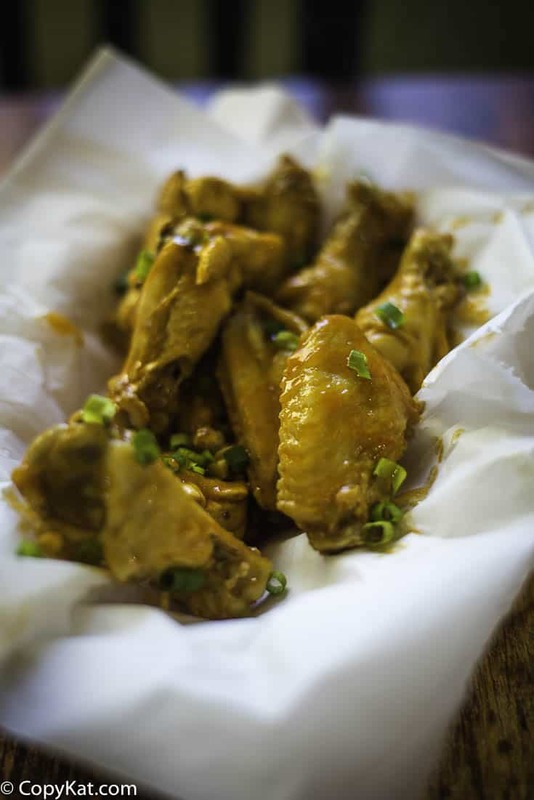 If you love wings, you’ll enjoy these homemade garlicky wings. They’re finger-lickin’ tasty with just the right amount of spiciness. Just don’t forget the napkins! Garlic Buffalo Air Fryer Chicken Wings perfect for the game, low carb, and the keto diet. Preheat air fryer to 390 degrees. Pat chicken wings with a paper towel, and sprinkle salt over the wings. Place the wings into the basket, and cook for 18 minutes, or until done. While the wings are cooking, in a small pot combine butter, Franks Red Hot sauce, minced garlic, and Worcestershire sauce. Heat on medium low until the sauce is heated through. Simmer the sauce, stirring occasionally until the wings have finished cooking. When the wings are done, place into a large bowl, add sauce and stir to coat the wings. 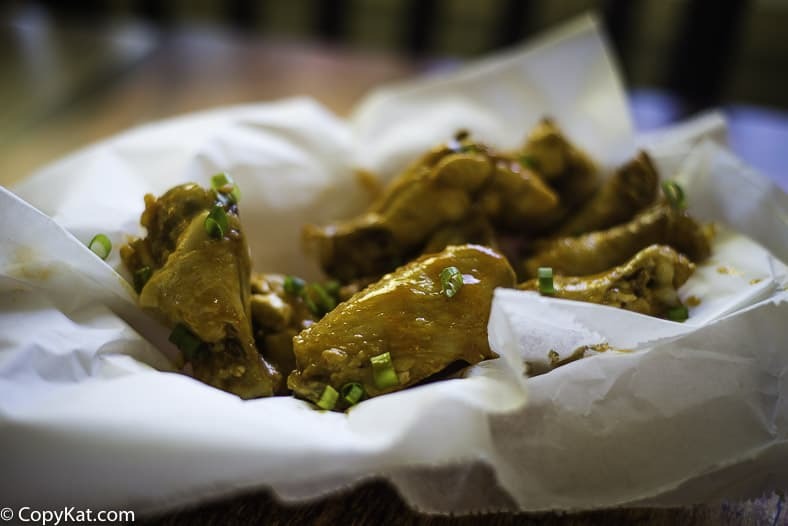 You may want to use all of the sauce, or you may want your wings lightly sauced. Extra sauce can be stored in the refrigerator. Thank you so much for sharing more air fryer recipes.Great blog!!! We recently purchased an air fryer, and love it! Although I’m usually the cook in the family, my hubby is now the self-appointed ‘air-fryer Chef’ (lol). Since none of us here are crazy about chicken wings, I wonder how chicken drumsticks would work. We’d most likely only need to increase the cooking time (& temp them), right? Sounds like a super yummy recipe Stephanie, so thanks. Yes, I would definitely extend your cooking time, I would shoot for an additional 10 minutes. What kind of Instant Pot do you recommend for two people?? This recipe called for the use of an Air Fryer, NOT an Instant Pot. They’re not the same appliance.